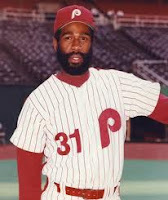 Garry Maddox was an outfielder with the Phillies from 1975-1986. Maddox entered the Majors with the San Francisco Giants, where he established himself as an everyday player in 1972. In May, 1975 Maddox was traded to Philadelphia for outfielder/first baseman Willie Montanez. Upon joining the Phillies, Maddox quickly became a key part of the team. In his first full season in Philadelphia, Maddox ranked third in the league in batting, with a .330 average, scored 75 runs and stole 29 bases to finish 5th in league MVP voting. A superior defensive outfielder, Maddox was a nightly human highlight reel long before the national and regional cable sports shows were broadcast into millions of homes on a daily basis. He won many Gold Glove Awards during his 12 seasons in Philadelphia, earning him the nickname "The Secretary of Defense". Metropolitans broadcaster and Hall of Famer Ralph Kiner once summed up Maddox's abilities well by stating, "Two-thirds of the Earth is covered by water, the other third is covered by Garry Maddox." The 1978 season was a solid one for Maddox as he strung together a 20-game hitting streak and led the team with 33 stolen bases. Unfortunately for Maddox, an uncharacteristic defensive miscue in the post-season became the more stand out memory of that year. In the 10th inning of game 4 of the NLCS against the Dodgers, Maddox dropped a routine fly ball off the bat of Dusty Baker, allowing the winning run to score and allowing Los Angeles to clinch the series. In 1980, Maddox won his 6th of 8 straight Gold Glove Awards and stole more than 20 bases for the 8th consecutive season. Maddox continued his 1980 contributions, redeeming himself in the MLB post-season, by driving in the winning run in the 10th inning of game 5 of the best-of-5 National League Championship Series against the Astros. The Phillies would go on to win their very first World Series title against the Royals. Over 6 post-seasons with the Phillies, Maddox would post a .271 batting average with 1 homerun and 11 RBI in 29 games played. Maddox would face injury problems in the later stages of his career, causing his playing time and production to decrease. Back surgery following the 1985 season led to him retiring in the opening month of the 1986 season. During his career with the Phillies, Maddox batted .284 with 85 homeruns, 566 RBI and 189 stolen bases. Maddox stays active in the community in his retirement. Each year he hosts a Barbecue Challenge, at Citizens Bank Park, that raises money for the Youth Golf & Academics Program, an enrichment program for Philadelphia youths.